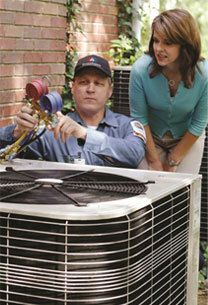 Air Conditioning Service: The last thing you want is to have your air conditioning stop working on a hot summer day. If this happens, we will be out there in no time to help resolve the problem and get the nice cool air back into your home. Typically A/C repairs can be minor fixes that will be done the same day. Maybe you’re just looking to purchase a more energy efficient system? If so, we can completely install and can handle it all. A new system can greatly reduce the amount of on-going expenses a home or business has during a normal working day. Additionally, it’s always important to maintain your A/C unit(s) seasonally so they are running properly and efficiently. So many clients can avoid costlier repairs by just having regular cleaning done to their units. Regular checkups by professionals is the way to save! Heater Repair & Service: Has your hot water heater stopped working in the middle of a shower? Has your furnace refused to light up again? Both of these can be common issues when its needed to call a heater & furnace repair specialist. The problem is generally an easy and quick fix that we have seen time and time again. Our goal is to get your heating back up and running in no time so you can go on with your daily life. It all depends on the type of heater model and the unique situation. Let us take care of your heating problems so you can make that cold Draper winter nice and cozy again. We know you’re looking for a dependable and honest heating and air conditioning company in you area. We won’t let you down! Give us a call today and give us the pleasure of taking care of your air conditioning and heating problems today! (*) denotes a required filed. Draper Heating and Air Conditioning offers the very best in expert and affordable heating and air conditioning service in Draper, UT. Discover the difference when you hire an honest company versus the other guys! We service residences as well as commercial buildings by well trained and background checked technicians. Never be without proper comfort in your home again. Call Now: 801-590-4646. Copyright © 2013 - 2018 Draper Heating and Air Conditioning - 14668 Draper View Cove Draper, UT 84020 - (801) 590-4646 - All Rights Reserved.